As summer hits Estes Park in full force, many families are eagerly venturing outside to enjoy the great outdoors. From the valley floor to the peaks above, this area is chalked full of exciting adventures for visitors of all ages. As one of the top providers of ATV rentals in Colorado, we are all about enjoying adrenalized activities for anyone looking to get the best ATV rides around. Anyone that has ever wanted to rip up and down ATV trails on an unguided tour upon a Polaris RZR or Honda TRX will be pleased when they arrive on the site to jump on our machines and ride. Estes Park ATV Rentals makes the entire renting process simple, giving you more time to enjoy the trails. We understand that our extreme sport may not be suitable for younger riders, which is why we’ll spend today looking at a few fun activities for kids in Estes Park. If your young ones do not like any of the fun Estes Park activities we listed last time, the following suggestions should help them get excited about their trip. If you are wanting to maximize your excitement, be sure to contact us for your ATV rental adventure! When you first drive into Estes Park, one of the first things you’ll see on the East side is a variety of organizations that provide miniature golf activities. Cascade Creek, Fun City, and Tiny Town all offer a plethora of activities for young ones, including go-karts, carpet slides, and so on. You can enjoy being a kid while entertaining your children here! 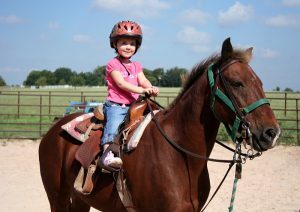 Riding atop a horse is a memorable adventure that is sure to bring exemplary fun for all ages. Estes Park holds several stables across the region, each with their own unique experiences and services. Children as young as four can hit the trail and enjoy the beautiful scenery from a unique vantage point. Make the most of your time outdoors as you take a tour through the wilderness surrounding our beautiful town. Estes Park’s activity list would not be complete without fishing. From the rivers to well-stocked ponds to Lake Estes itself, anglers of all ages will be able to enjoy the fresh air while excitedly trying to reel in the big ones. Get your young one out to enjoy life at one of our many fishing locales! All of this talk of water may give your children the motivation to make a splash in one of Estes Park’s several swimming locations. From our quality hotel pools to the Estes Park Aquatic Center, your kids will be able to beat the heat while enjoying their own aquatic adventures. Our park rangers are more than happy to provide educational programs that supply children with a plethora of interesting nature facts. From bear safety to ecological balances, there is a lot of entertaining information to absorb about Rocky Mountain National Park and its inhabitants. Your kids will have a grand time learning about the great outdoors while you’re enjoying your ride in a side by side ATV! While our list of fun activities for kids in Estes Park may be helpful, it is by no means complete. Our mountain town provides a wide range of entertainment for family members of all ages. With so many options, the only issue you’ll have is narrowing down which ones to enjoy. Anyone seeking an adrenalized adventure will benefit from contacting Estes Park ATV Rentals. Our Colorado ATV rentals make hitting the trails and having a good time easy. We’re now in the busy season, so be sure to call today to reserve your ATV riding adventure!